Successfully Added DVB-T Dongle - Free Digital TV + Scheduled Recordings to your Shopping Cart. DVB-T Dongle direct from China, letting you receive free Digital TV shows direct to your Computer and also letting you schedule times to record your favorite shows in case you are not there to watch them. If you are tired of just Cable or Satellite TV, and really tired of paying the premium prices for them, this is just the product you are looking for. Not only do you get to view them, but you can also record your favorites to MPEG-2 format to watch them over and over. For just a fraction of the price you normally have to pay, this wholesale DVB-T Dongle will easily turn your computer into a mobile TV Set for you. A great bargain for yourself, or buy in bulk and net yourself a great profit from this popular item. Hi Ronn. We have many customers who happily use this for Freeview in England. 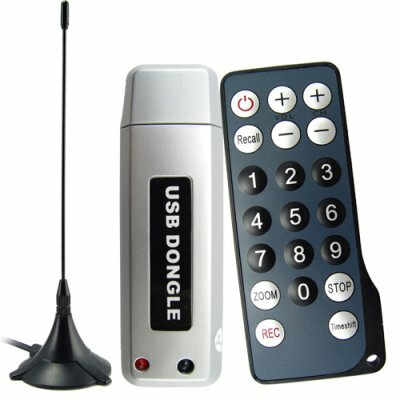 This model DVB-T Dongle is for connecting to the USB of your Laptop or Desktop PC for watching TV. Is it work in United Kingdom? Is it work on a in-car dvd player only? brilliant product ,amazing!spot on delivery as well!Couldn`t ask for more. I' d like to know if it can work in Brazil.